So for my Sunday Favourites today I wanted to show you three great base coats I have used or am using and tell you what I like about them. First of all, I would recommend always using a base coat when painting your nails, no matter what kind it is. If you don’t, the polish you are wearing is likely to stain your nails (especially blue colours like to do this), which makes not wearing any polish no fun at all because your nails look all dirty and disgusting. Even if a polish doesn’t stain your nail, it’s good to use a base coat to create a nice canvas for your colour. I always feel better when putting one on, even though I buff my nails and try to make them an even surface, I don’t like to overdo it and a base coat will even out any ridges I might still have. 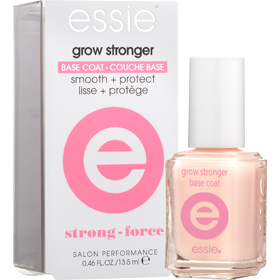 The first one I have used and liked is Essie Grow Stronger. I can’t really say I felt a difference in the strength of my nails, but it’s a great base coat as is evens out the nail and also dries really quick, so you can start your actual mani asap! Another one from Essie is Help Me Grow. Again, I can’t really say it helped my nails grow faster, but it’s a great base for your mani as like with the one mentioned before, it dries really fast. Ain’t nobody got time to wait for that base coat to dry! My favourite one, which I have been using all the time since I got it, is OPI NailEnvy in the original formula. I believe there are a few different kinds of NailEnvy polishes out there for different problems you might have with your nails (brittle, dry etc.) but this one works great for me! It dries in a flash and also with this one, I can tell my nails do grow faster than they normally would, which is great when you have had a break and want to get your nails back to the same length. I’m running low on my bottle but will finish my Essie Help Me Grow before I repurchase this, as I still have loads left of that. If you have any questions or would like to recommend a great base coat to me that you love, be sure to drop me a comment!